HALL OF FAME FOR SPORTS TEACHERS? WE celebrated Teachers Day on Wednesday but we must not forget the special breed of “sports teachers” from the 1960s, 1970s and 1980s who acted as talent scouts, coaches, councillors and mentors. They had the heart and soul for sports and did their share for development. They didn’t receive remunerations, but gave time, money and passion to groom thousands of future national athletes and icons. The Ministry of Education (MOE) should set up a Hall of Fame for them. There are various reasons why teachers of late have been blamed for not having the same commitment for sports. Among them are lack of rewards, schools not interested in sports, education taking precedence, teachers concentrating on tuition and diminishing number of school fields. In all fairness MOE, especially the sports division headed by Dr Mehander Singh, are doing their best to make sports relevant in the education system. Under high performance schools, 2,061 coaches and 37,339 athletes are involved in 860 district training centres which involves eight core sports — football, hockey, gymnastics (artistic and rhythmic), sepak takraw, athletics, archery, bowling and badminton. Then there are development programmes in the form of league and circuit for football, athletics, hockey and netball. The cream of potential athletes surface from the Malaysian School Sports Council (MMSM) sports calendar which involves 24 sports. Top athletes from MSSM are then selected for Asean, Asian and world age group tournaments. But the bulk of athletes come from the two sports schools. It was different back in the day. I benefited from a dedicated school teacher, Master Kirubakaran Rokk, who was my football coach at St John’s Institution. He taught civics, but his passion for football was overflowing. 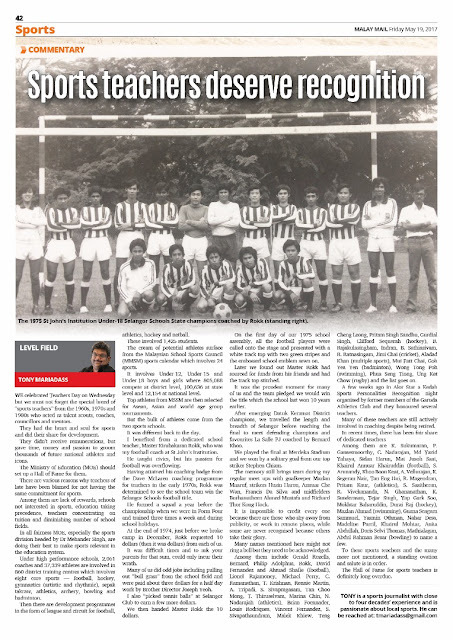 Having attained his coaching badge from the Dave McLaren coaching programme for teachers in the early 1970s, Rokk was determined to see the school team win the Selangor Schools football title. He formed a squad a year before the championship when we were in Form Four and trained three times a week and during school holidays. At the end of 1974, just before we broke camp in December, Rokk requested 10 dollars (then it was dollars) from each of us. It was difficult times and to ask your parents for that sum, could only incur their wrath. Many of us did odd jobs including pulling out “bull grass” from the school field and were paid about three dollars for a half day work by Brother Director Joseph Yeoh. I also “picked tennis balls” at Selangor Club to earn a few more dollars. We then handed Master Rokk the 10 dollars. On the first day of our 1975 school assembly, all the football players were called onto the stage and presented with a white track-top with two green-stripes and the embossed school emblem sewn on. Later we found out Master Rokk had sourced for funds from his friends and had the track top stitched. It was the proudest moment for many of us and the team pledged we would win the title which the school last won 10 years earlier. After emerging Datuk Keramat District champions, we travelled the length and breadth of Selangor before reaching the final to meet defending champions and favourites La Salle PJ coached by Bernard Khoo. We played the final at Merdeka Stadium and we won by a solitary goal from our top striker Stephen Chiam. The memory still brings tears during my regular meet ups with goalkeeper Mazlan Maaruf, strikers Husin Haron, Annuar Che Wan, Francis Da Silva and midfielders Burhanutheen Ahmed Mustafa and Richard Thor Kong Hock. It is impossible to credit every one because there are those who shy away from publicity, or work in remote places, while some are never recognised because others take their glory. Many names mentioned here might not ring a bell but they need to be acknowledged. 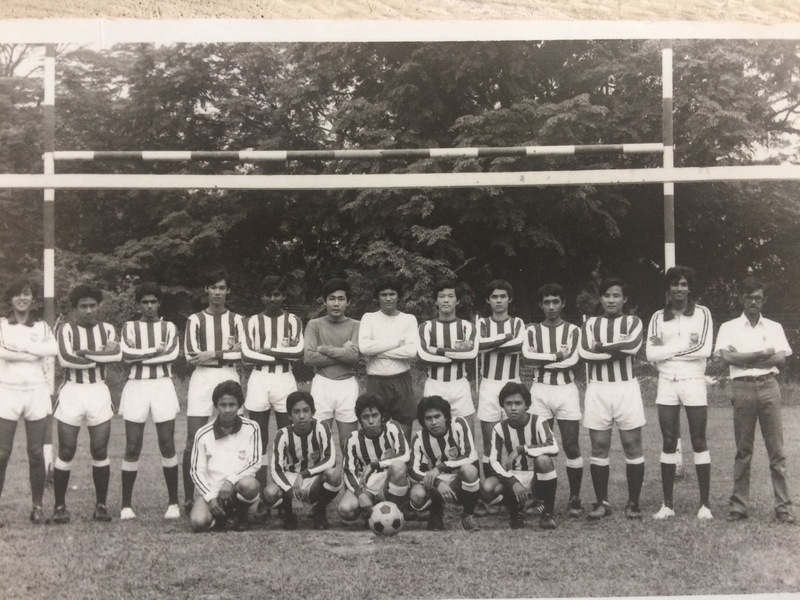 Among them include Gerald Rozells, Bernard, Philip Adolphus, Rokk, David Fernandez and Ahmad Shafie (football), Lionel Rajamoney, Michael Perry, C. Ramanathan, T. Krishnan, Rennie Martin, A. Tripadi, S. Sivapragasam, Tan Choo Mong, T. Thiruselvam, Marina Chin, N. Nadarajah (athletics), Brian Foennader, Louis Rodriques, Vincent Fernandez, S. Sivapathsundram, Malek Khiew, Teng Cheng Leong, Pritam Singh Sandhu, Gurdial Singh, Clifford Sequerah (hockey), B. Rajakulasingham, Indran, B. Sathiasivam, R. Ratnasingam, Jimi Chai (cricket), Aladad Khan (multiple sports), Mui Fatt Chai, Goh Yea Yen (badminton), Wong Tong Poh (swimming), Phua Seng Tiong, Ung Ket Chow (rugby) and the list goes on. A few weeks ago in Alor Star a Kedah Sports Personalities Recognition night organised by former members of the Garuda Athletics Club and they honoured several teachers. Many of these teachers are still actively involved in coaching despite being retired. Among them are K. Sukumaran, P. Gansesmoorthy, C. Nadarajan, Md Yazid Yahaya, Sidan Harun, Mat Jusoh Saat, Khairul Annuar Khairuddin (football), S. Arunandy, Khoo Boon Keat, A. Vellurajan, K. Segeran Nair, Tan Eng Hui, R. Magendran, Pritam Kaur, (athletics), S. Sasitheran, R. Vivekananda, N. Ghananathan, K. Sunderasan, Tejar Singh, Yap Gark Soo, Mokhtar Baharuddin, Durai Raj (hockey), Mazlan Ahmad (swimming), Guana Seagarn Sammuel, Yasmin Othman, Nahar Desa, Madeline Parril, Khairul Mohtar, Anita Abdullah, Doris Selvi Thomas, Mathialagan, Abdul Rahman Besar (bowling) to name a few. To these sports teachers and the many more not mentioned, a standing ovation and salute is in order. The Hall of Fame for sports teachers is definitely long overdue.